Ahh so here is the Screen Shot I promised, I played a little more since the last post and have finished the first quest in Act II. I think I enjoy this Arabic themed area more than the last. 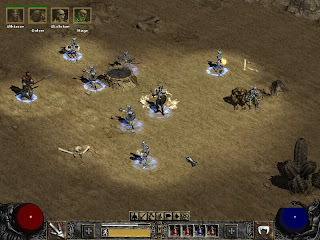 As you can see I’ve assembled myself a small army consisting of Four Skeleton Soldiers, Three Skeleton Mages, a Clay Golem, and my new Guardian Hireling Alhizeer. I figured out how to switch to the expansion mode and have started outfitting Alhizeer with some nice equipment, including a spear with socketed with three +lighting Damage gems! I’ve been reading up on Guild Wars more and more and I think I have convinced myself to buy it, but I don’t want to rush out and get it right away. I need to see how much work I’ll have to be doing for these classes, plus I still have more Diablo II and Pearl to play, I don’t need to be splitting my time so much with another game. As you can see on the right, I’ve signed myself up for an Xfire account, that way I (and you) can keep track of the PC games I am playing. This way if I do get Guild Wars ahead of time you’ll be able to see so before I divulge it. I wish I actually knew people who used this application, but hopefully I’ll run into some people in game or on message boards, or convert my own friends onto it. Possibly more to come?! I don’t know, as quiet/boring as things are around here, blogging actually seems like a decent pass time.